New economic developments such as E-Commerce raise not only economic but also legal questions. Most of these questions are treated in a different way by the jurisdictions or have not been regulated so far. Companies are facing a material uncertainty with regard to international transactions which are typical of E- Commerce. The European and national regulations which have already been adopted are … only for some part leading to clarification. The possibilities for legal solutions as well as the interpretation of the new legislation differ within the separate countries and their Courts. 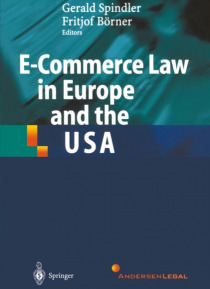 In order to provide an overview of the most important legal issues of E- Commerce for international entities and internationally practising consultants, this book describes the regulatory framework in nine European countries (Belgium, France, Germany, Great Britain, Italy, Norway, Spain, Switzerland, The Nether- lands) and the United States of America. The country-specific contributions are presented in alphabetical order and fol- low a questionnaire which can be found in the beginning. As the structure in all contributions is uniform, the reader can fmd an answer to a legal question of inte- rest quickly and clearly arranged for all countries. The work is not aiming at an extensive discussion of each legal question. Moreover, the goal is to present an overview of the main questions and trends in E-Commerce Law, in particular with regard to the adoption of several EU Directives.